> Home > News > Take Our Kids to Work day! Take Our Kids to Work day! On the first Wednesday of November every year, The Learning Partnership holds Take Our Kids to Work™ day, where grade 9 students spend the day in the workplace of a parent, relative, or friend. In 2012 Take Our Kids to Work day fell on Wednesday, November 7 and our Toronto office welcomed Kayla Vigneault, daughter of our Construction Coordinator, Andre Vigneault. During her visit, Kayla was trained to extinguish a jet fuel fire simulation using different types of fire extinguishers (CO2 & ABC). Then, Kayla assisted one of our field technicians with a weekly fire pump test. 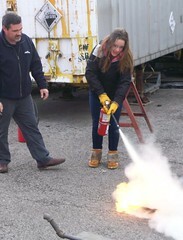 It was undoubtedly a well filled day of learning for Kayla and who knows, maybe she will follow in her dad's footsteps and join us someday at Viking Fire Protection?